Halloween is just around the corner, and what better time to celebrate dressing up, candy, and pumpkins than by taking home some lucrative cash winnings. Click here to play! Join the ghoulish combos down at the slots today! 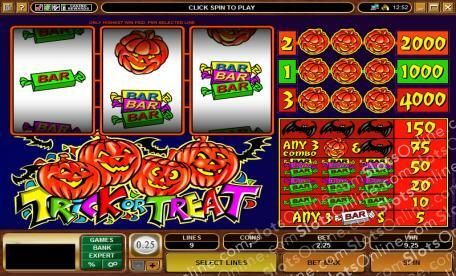 Trick or Treat is a spine-tingling 3-reel slot played across three active pay lines, with three coins slots. The more lines you open will give you better opportunities for large payouts, while the more coins will allow you to receive better payouts on winning combinations. There are no Wilds or Scatters at Trick or Treat, instead you will receive hefty payouts for three Pumpkins in a row. Depending on how many coins you play, more jackpot lines will open up. For example, a three-Pumpkin jackpot win on pay line one will earn you 1000 coins, while a third line jackpot will win you 4000 times your initial wager. Enjoy the sights and sounds of Halloween as you win yourself some frighteningly good payouts at Trick or Treat.